Forma de citar: Zapata., S., Cardona, A., Jaramillo, C., Valencia, V., and Vervoort, J. 2016. U-Pb LA-ICP-MS geochronology and geochemistry of Jurassic volcanic and plutonic rocks from the Putumayo region (southern Colombia): tectonic setting and regional correlations. Boletín de Geología, 38(2): 21-38. New field data, geochemical analyses and zircon U-Pb LA-ICP MS data were obtained on plutonic and volcanic rocks of the Mocoa Batholith and Saldaña Formation in southern Colombia Putumayo region. Results suggest that the plutonic and volcanic activities are closely related to a common magmatic history. This volcano-plutonic association presents a well-defined LILE and LREE enrichment and negative Nb and Ti negative anomalies characteristic of continental magmatic arcs. Volcanic and plutonic rocks crystallized between 180-186 Ma as revealed by U-Pb zircon geochronology. 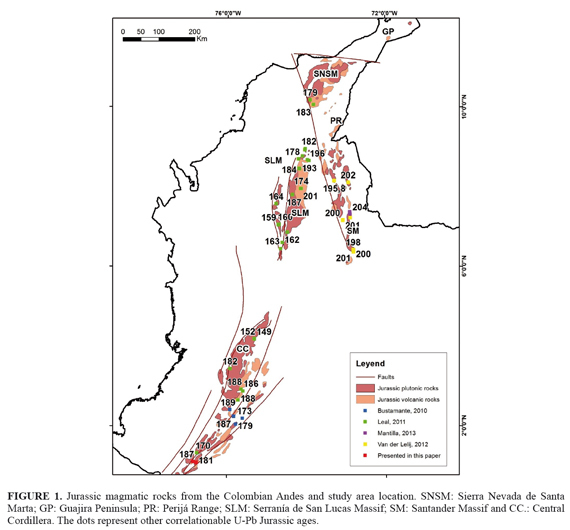 The magmatic activity is temporally and chemically correlatable with other magmatic arc exposures in Colombia and Ecuador. These units may represent the remnants of a single belt which includes several units from 4°N in Colombia and 5°S in Ecuador. This arc is related to the widespread Jurassic continental magmatic arc setting that characterized the continental margins of the Americas after Pangea break-up. Keywords: Jurassic, continental arc, geochronology, geochemistry. Nuevos datos de campo, análisis geoquímicos y U-Pb LA-ICP MS en circón fueron obtenidos en rocas plutónicas y volcánicas en el Batolito de Mocoa y la Formación Saldaña, en el departamento de Putumayo en el sur de Colombia. Los resultados sugieren que el volcanismo y plutonismo que compartieron la misma historia de evolución magmática. Esta asociación vulcano-plutónica muestra enriquecimientos de LILE y LREE acompañado de anomalías negativas de Nb y Ti característico de arcos continentales. Rocas volcánicas y plutónicas de este arco continental cristalizaron entre 180 y 186 Ma como lo indica la geocronología U-Pb en circón. La actividad magmática esta temporal y geoquímicamente correlacionada con otro arco magmático expuesto en Colombia y Ecuador. Estas unidades pueden representar los remanentes de un solo cinturón que incluye varias unidades entre los 4°N en Colombia y 5°S en Ecuador. Este arco está relacionado a un cinturón magmático Jurásico fragmentado, que caracterizo las márgenes continentales de las Américas luego de la ruptura del súper continente Pangea. Jurassic magmatism is one of the most extensively exposed igneous record in the Colombian Andes (FIGURE 1). It includes different volcanic sequences and batholith bodies limited as fault bounded blocks along most of the Eastern Andes (Aspden et al., 1987). Different tectonic environments have been proposed to explain this major Jurassic province in the Northern Andes: (1) continental arc magmatism associated to back-arc basin formation (Aspden et al., 1987; Bustamante et al., 2010; Pindell and Tabbutt, 1995; Sarmiento et al., 2006; Spikings et al., 2014; Van der Lelij et al., 2015); (2) rift related setting associated with the Pangea breaking and the development of Proto-Caribbean sea between North and South America (Cediel et al., 2000; Cediel et al., 2003; Jaillard et al., 1990). A major difficulty for the understanding of this tectonic scenario is the existence of late Mesozoic and early Cenozoic terrain translation along the Jurassic continental margin, which modified the latitudinal position of the Jurassic magmatic domains (Bayona, et al., 2006). In this contribution we present new U-Pb LA-ICPMS zircon geochronology data and geochemistry reconnaissance from the Mocoa Batholith and Saldaña Formation in southern Colombia. The new results confirm the existence of a Middle Jurassic basaltic to rhyolitic arc magmatism, where volcanic and plutonic activity was genetically related. The results can be correlated with the evolution of other Jurassic segments of the Colombian Andes. The northwestern margin of South America is composed of different structural blocks bounded by major regional faults. This structural complexity reflects several episodes of Mezo-Cenozoic oceanic terrane accretion, continental arc growth and strike translation of paraautochthonous continental terranes (Bayona et al., 2006; Bayona et al., 2010; Escalona and Mann, 2010; Montes et al., 2010; Pindell et al., 1998; Pindell et al., 2005; Spikings et al., 2014; Spikings et al., 2005; Toussaint and Restrepo, 1996; Villagómez et al., 2011; Villagómez and Spikings, 2013). In Colombia, the northern Andes include three main ranges composed by different litho-stratigraphic units (FIGURE 1). The Western Cordillera comprises allochthonous sequences of mafic volcanic rocks formed in island arc and plateau tectonic setting, with associated Upper Cretaceous marine sediments (Álvarez, 1979; Kerr et al., 1996; Toussaint and Restrepo, 1996; Villagómez et al., 2011). The Central Cordillera comprises a poly-metamorphic basement of probably Devonian and Permo-Triassic ages (Ordóñez-Carmona and Pimentel, 2002; Spikings et al., 2014; Toussaint and Restrepo, 1996; Villagómez and Spikings, 2013; Villagómez et al., 2011; Vinasco et al., 2006). The Eastern Cordillera comprises an early Paleozoic basement covered by Paleozoic sediments and metasedimentary strata, as well as Mesozoic marine sediments deposited in extensional basins, which were inverted in the late Miocene (Mora et al., 2009; Taboada et al., 2000). Precambrian rocks are common both at the eastern flank of the Central Cordillera or as part of isolated massifs in the Eastern Andes. All these tectono-stratigraphic domains are intruded and covered by Paleozoic to Cenozoic plutonic and volcanic rocks. The spatial and temporal distribution of this magmatic activity has been related to major changes on plate convergence configuration and/or the episodes of terrane accretion (Aspden et al., 1987; Restrepo and Toussaint, 1991). (1) Isolated and fault bounded massifs that include the Sierra Nevada de Santa Marta, Perijá Range and Guajira Peninsula (Cardona et al., 2006; MacDonald, 1964; Tschanz et al., 1974). (2) An Eastern Andes province that includes Early Jurassic magmatism in the Santander and San Lucas Massif and the northern termination of the Central Cordillera (Goldsmith et al., 1971; Mantilla et al., 2013; Van der Lelij et al., 2015). (3) A continuous southern Jurassic belt exposed in the Central Cordillera, Upper Magdalena basin and Garzón Massif that extends to the south to the Putumayo region (Bayona, 1994; Bustamante et al., 2010; Chiaradia et al., 2009; Sillitoe et al., 1982; Villagómez et al., 2011). Regional paleogeographic models, stratigraphic considerations or scarce geochemical data have been commonly used to propose two different tectonic environments: (1) a continental volcanic arc related with the Pacific subduction (Boschman, et al., 2014; Bustamante et al., 2010; McCourt et al., 1984; Meschede and Frisch, 1998; Pindell and Tabbutt, 1995; Pindell and Erikson, 1993; Spikings et al., 2014; Toussaint, 1995), (2) an intracontinental extensional rifting that can be associated to the breakup of Pangea in the Triassic and Early Jurassic (Cediel et al., 2003; Cochrane et al., 2014; Pindell and Dewey, 1982; Ross and Scotese, 1988). As already mentioned, the limited precise chronological and compositional database of the Jurassic magmatic rocks has precluded a precise analysis of this magmatism in southern Colombia. The Andean Cordillera in southern Colombia merges as a single chain to form the Colombian Massif before splitting in the Central and the Eastern Cordillera. The older rocks in this massif include the gneissic basement of the Cocha - Río Tellez Complex and associated meta-sedimentary rocks considered Precambrian and Paleozoic in age (Murcia and Cepeda, 1983; Ponce, 1979). This basement is covered and intruded by Jurassic volcano-sedimentary and plutonic rocks of the Saldaña Formation and the Mocoa batholiths. The basement is unconformably overlain by Early and Late Cretaceous marine strata represented by the Caballlos, Villeta and Rumiyaco Formations (Amaya y Centenaro, 1997), followed by the continental Pepinos Formation and a widespread Neogene volcanic cover (Mora et al., 1998; Murcia and Pichler, 1987). Regional studies have correlated volcanic and pyroclastic rocks exposed in southern Colombia along the Putumayo, Caquetá and Mocoa rivers, with the Saldaña Formation of the Upper Magdalena Valley and the Huila area (Ayala et al., 2012; Bayona, 1994; Marquínez and Velandia, 2001). In southern Colombia this volcano-sedimentary formation is exposed in the high topographic altitudes of the Caqueta, Putumayo and Mocoa rivers. It is exposed along three SW-NE belts (FIGURE 2). It includes volcanic and porphyritic rocks ranging from basaltic to rhyolitic composition, crystalline and vitreous andesitic to rhyolitic tuffs, agglomerates and ignimbrites. Several tuffaceous sandstones composed by quartz and feldspar crystals and volcanic rock fragments are intercalated with the volcanic rocks. 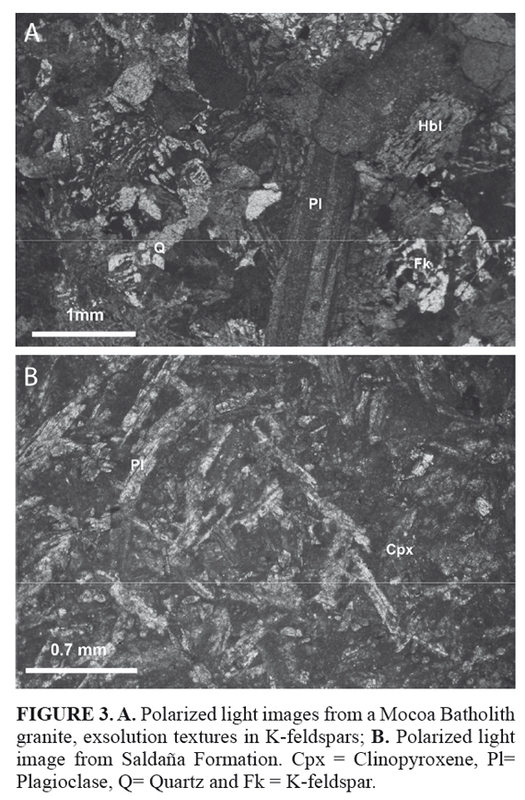 The Saldaña Formation presents faulted and depositional contacts with Cretaceous marine sediments and intrusive relations with the Mocoa Batholith (FIGURE 2B). Published age constraints from the Saldaña Formation came from paleontological results in the Upper Magdalena Valley, which is located to the north of the study area. They include Late Triassic to Early Jurassic depositional ages (Widemann and Mojica, 1980). No previous absolute geochronological data have been reported for the volcanic rocks of the Saldaña Formation in the Putumayo region. The Mocoa Batholith extends from the Ecuadorian border towards northern Putumayo in Colombia. This unit is exposed as a series of segmented SW-NW elongated bodies. It is composed of monzogranites with minor syenogranites, granodiorites and quartzmonzonites. Porphyritic facies with similar compositions are exposed at the borders of the body. Whole rock and biotite K-Ar ages in the Mocoa Batholith yielded ages between 170 Ma and 210 Ma, whereas feldspar and sericite ages between 136 Ma and 166 Ma (Jaramillo et al., 1980; Sillitoe et al., 1982). Although calculated ages may reflect cooling, mineralization events or argon loss, the K-Ar method not assess accurately the age of this unit (McDougall and Harrison, 1999). Bulk whole rock chemical composition of 10 samples was determined by inductively coupled plasmamass spectrometry (ICP-MS) at Acme Analytical Laboratories Ltd. in Vancouver, Canada. A 0.2 g aliquot is weighed into a graphite crucible and mixed with 1.5 g of LiBO2 flux. The crucibles are placed in and heated to 1050° C for 15 minutes. The molten sample is dissolved in 5% HNO3. Calibration standards and reagent blanks are added to the sample sequence. Sample solutions are aspirated into an ICP emission spectrograph (Jarrel Ash Atom Comb 975) for determining major oxides and certain trace elements (Ba, Nb, Ni, Sr, Sc, Y and Zr), while the sample solutions are aspirated into an ICP-MS (Perkin-Elmer Elan 6000) for determination of the trace elements, including rare earth elements. Heavy mineral concentrates of the < 350μ fraction were crushed, sieved and hydraulically separated. Subsequent magnetic and heavy liquid separation with methylene iodide was used to concentrate zircons. Inclusion-free zircons from the non-magnetic fraction were then handpicked under a binocular microscope. Thirty four and twenty one zircons of the samples SZH 12.1 and SZH 7.2, respectively, were mounted in epoxy and polished to half thickness for laser ablation analysis using laser ablation-inductively coupled plasma-mass spectrometry. All LA-ICP-MS U-Pb analyses were conducted at Washington State University using a New Wave Nd:YAG UV 213-nm laser coupled to a Thermo Finnigan Element 2 single collector, double-focusing, magnetic sector ICPMS. He and Ar carrier gases delivered the sample aerosol to the plasma. Operating procedures and parameters are discussed in greater depth by (Chang et al., 2006) and are only briefly outlined here. Each analysis takes approximately 35 seconds, it consisted of a short blank analysis followed by 300 sweeps through masses 204, 206, 207, 208, 232, 235, and 238, with a repetition rate of 10 Hz, and a spot size of 30 μm. LA-ICP-MS isotopic analyses are affected by two forms of inter-element fractionation that must be corrected (Kosler and Sylvester, 2003). Timedependent fractionation results from the more efficient volatilization of Pb over U as the laser excavates successively deeper levels in the ablation pit during an analysis, which in turn leads to an increase in 206Pb/238U and 207Pb/235U ratios with time (Eggins et al., 1998). It has been demonstrated that U/Pb fractionation is approximately linear over the short time of the analysis (Kosler and Sylvester, 2003). By definition, time-dependent fractionation is zero at the beginning of the analysis. Regression of time series data to the intercept at t = 0, therefore, yields the point at which time- dependent fractionation equals zero. We used two zircon standards: Peixe, with an age of 564 Ma (Dickinson and Gehrels, 2003), and FC-1, with an age of 1099 Ma (Paces and Miller, 1993). Peixe was used to correct the 238U/206Pb and 235U/207Pb ratios and FC-1 was used to correct the 207Pb/ 206Pb ratios. Time-independent (or static) fractionation is the largest source of uncertainty in LA-ICP-MS U-Pb geochronology and results from mass and elemental static fractionation in the plasma and also poorly understood laser-matrix effects (Kosler and Sylvester, 2003). It is corrected by normalizing U/Pb and Pb/Pb ratios of the unknowns to the zircon standards (Chang et al., 2006; Shuster and Farley, 2009). Common Pb can represent a proportionally large contribution to the total Pb in Mesozoic and younger U-poor zircons. However, common Pb is typically not significant in LA-ICP-MS analyses, most likely because it is concentrated in cracks and inclusions, which can be avoided. When this is not possible, the influence of common Pb is easy to recognize on Tera- Wasserburg diagrams because analyses tend to line up on a steep linear trajectory that can be anchored at a reasonable 207Pb/206Pb common lead composition (y-intercept) (DeGraaff-Surpless et al., 2002). Common Pb corrections were made on these analyses using the 207Pb methods (Williams, 1998). Uranium-lead data were reduced using Isoplot (Ludwig, 2007). The ages that we report are followed by two uncertainties: the first is derived from the concordant or intercept age calculation alone, and the second represents our systematic uncertainty during that session, with the error from the standards quadratically added to the analytical error. The SW-NE cross section (FIGURE 2) includes an intercalation of gneisses and biotite schist from the Paleozoic La Cocha - Río Tellez complex. These gneisses are overthrust by Jurassic mylonitized hornblende-biotite quartzfeldspathic rocks oriented N-S and dipping 50° to the east. These mylonitized granitoids may have Jurassic plutonic protoliths. Thin sections present an irregular foliation defined by chlorite formation after amphibole separated by undulatory quartz and mantle and core structures of the plagioclase. These observations indicate at least greenschist facies deformation. This mylonitized plutonic remnant is also overthrusting Cretaceous sedimentary rocks of the Caballos Formation. The Cretaceous rocks include an intercalation of folded lutites and well sorted quartz sandstones that unconformably overlies the Saldaña Formation to the east (FIGURE 2). The Saldaña Formation is made of an intercalation of volcanic lavas and tuffs dipping between 40-90° to the northwest and the southeast. Within the easternmost segment of the profile, the Mocoa Batholith and associated dikes that intrude the Saldaña Formation are exposed (FIGURE 2B). The Mocoa Batholith includes diorites, granodiorites, granites and porphyritic dikes. Samples contain hornblende (20-50%), plagioclase (30-60%), K-feldspar (15- 30%) with variable quartz (5-40%) and minor zircon, apatite, biotite and muscovite. The porphyritic facies include a micro-crystalline matrix (>60%) composed by quartz and plagioclase with amphibole, plagioclase and feldspar crystals. Both quartz and K-feldspar are present as a late crystallization phase, as suggested by the more anhedral and intercrystal distribution. An overimposed alteration is indicated by the presence of sericite, opaques and carbonates replacing the preexisting minerals (FIGURE 3A). Petrographic analysis from the Saldaña Formation indicates the presence of fine-grain basalts composed of clinopyroxene, plagioclase and opaque minerals with minor olivine, ortopyroxene and epidote (FIGURE 3B). Intermediate andesitic volcanic rocks include amphibole, quartz and plagioclase as well as a lack of olivine. Clinopyroxene crystals are more ehuedral and seems to be early cristallyzation phase, a feature that may be a consequence of the presence of water that commonly suppressed the early crystallization of plagioclase in wet arc magmas (Sisson and Grove, 1993). Ten samples were selected for major and trace element geochemistry, five from the Saldaña Formation and five from the Mocoa Batholith Results are presented in supplementary TABLE 1. 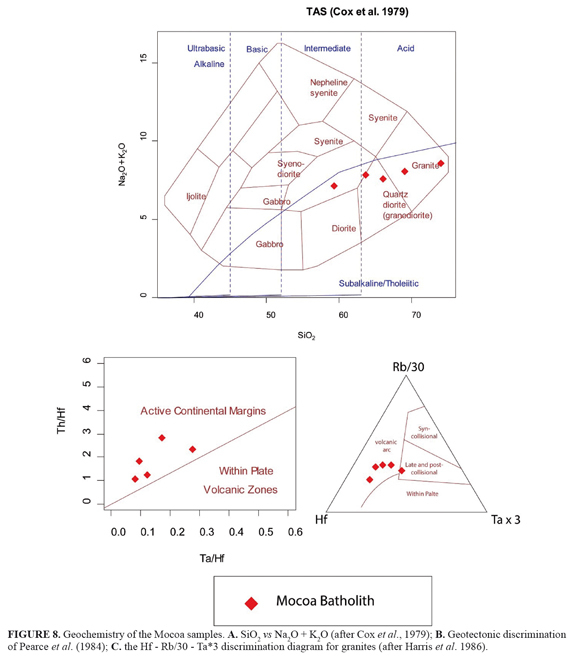 When compared in bi-variate diagrams, including SiO2 vs CaO, K2O and Fe2O3 follow a correlation trend, suggesting that the samples can be related to a similar magmatic evolution. 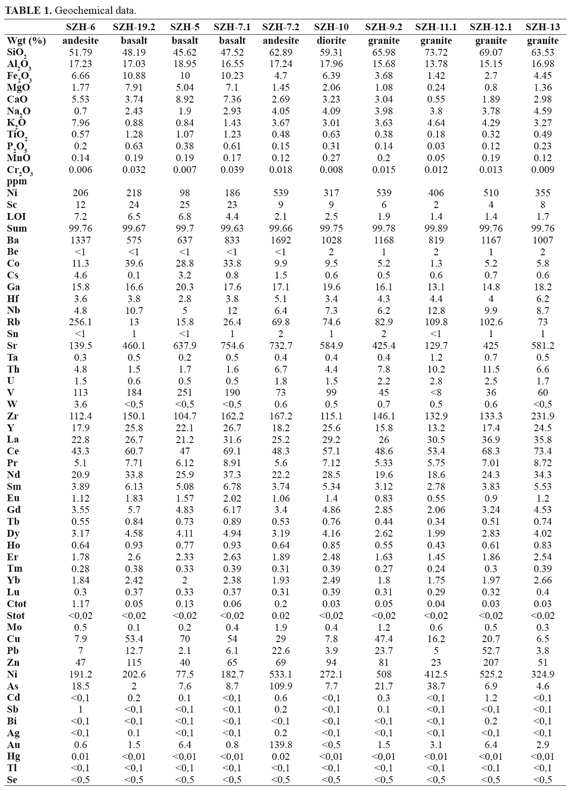 The apparent lack of correlation in an intermediate samples and some dispersion in the basaltic samples may be related to hydrothermal alteration that have remobilized some of the major elements, as is also seen in high lost on ignition values (TABLE 1). Within multi-elemental plots all samples show similar patterns of enrichment including high Pb values (FIGURE 4). All samples are grouped within the high- K series using the classification scheme of (Peccerillo and Taylor, 1976) (FIGURE 5A). Mg# values range between 34 and 58 that can be related to different degrees of crystal fractionation (FIGURE 5B). 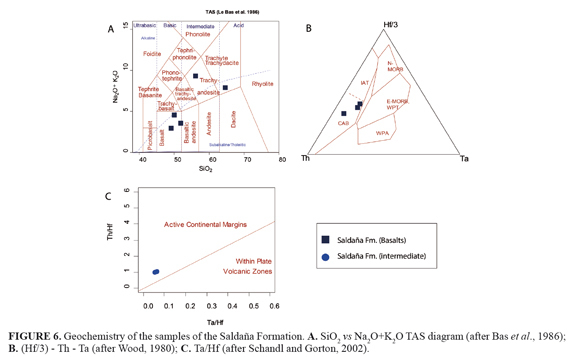 Samples from the Saldaña Formation are characterized by SiO2 values between 45.6%-62.8%, with Na2O varying between 0.7% and 4.05% and K2O values between 0.84%- 7.96%. MgO values lay between 1.95%-7.41%, whereas Fe2O3 also shows a considerable variation between 4.7-10.88. 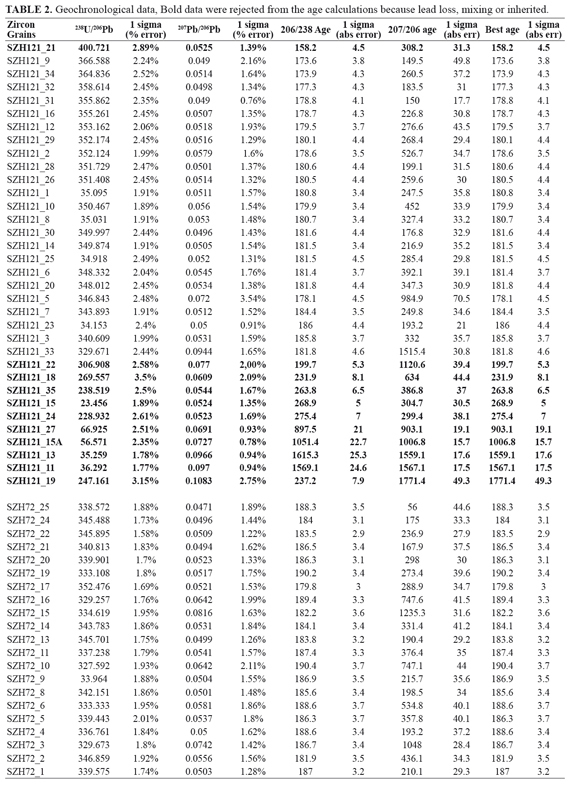 Al2O3 is less variable with values between 16.55%-18.95%. When compared against MgO, Ni and TiO2 (not shown, TABLE 2) also follow a differentiation trend which is characteristic of crystal fractionation due to the accumulation of pyroxene and titanite. Within the TAS diagram after (Bas et al., 1986) the volcanic rocks vary from basalts to trachy-dacites (FIGURE 6A). 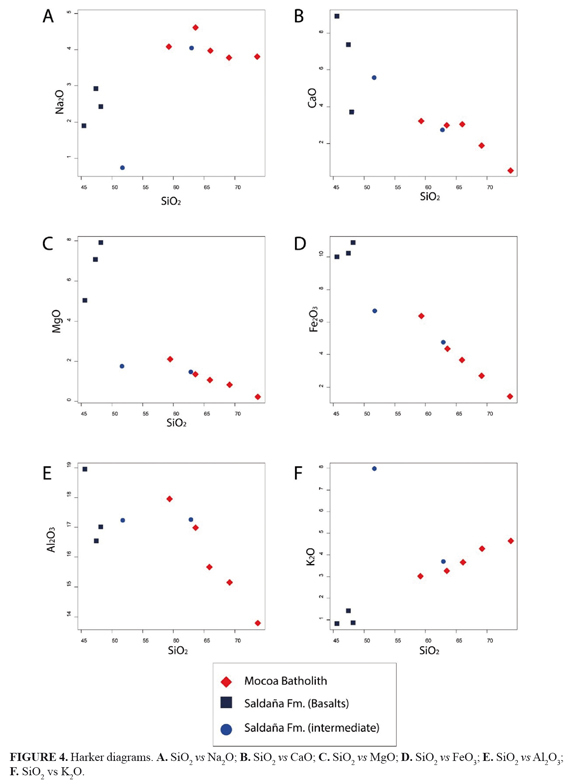 Harker bivariate plots from the Saldaña Formation are characterized by a positive correlation of SiO2 against Na2O and K2O and negative correlation with CaO, MgO and Fe2O3 (FIGURE 4) that may be related to crystal fractionation of olivine, clinopyroxene and Ca-rich plagioclase. 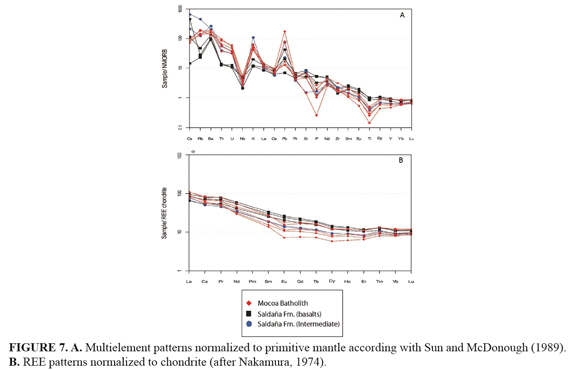 Rare earth elements patterns (REE) normalized to chondrite (Nakamura, 1974) (FIGURE 7B) are characterized by enrichment in light rare earth elements (LREE) when compared with heavy rare earth elements (HREE). The samples show a negative Eu/Eu* anomaly between 0.95 and 0.97 and La/YbN between 7.07 and 8.97. Multi-elemental patterns normalized to the primitive mantle of (Sun and McDonough, 1989) (FIGURE 7A) yielded a relative enrichment of large ion lithophile elements (LILE) such as Ba, Rb, Sr and Th and well-defined negative Nb, P, and Ti anomalies, the high normalized HREE reveals no residual garnet in the melt and therefore is more akin to shallower melting conditions. Tectonic discrimination diagrams after (Schandl and Gorton, 2002) for intermediate rocks and (Wood, 1980) for basaltic rocks that considered Th enrichment due to the non-conservative behavior of Th in subduction zones, and the relation of Ta with the presence of Ti minerals in the source, both show a continental arc affinity (FIGURE 6C and 6B). SiO2 values range between 59.31% and 73.72%; Na2O values are between 3.78 and 4.59; K2O varies between 3.01% and 4.64%. Following Cox et al. (1979), samples can be classified as granodiorite to granite (FIGURE 8A). 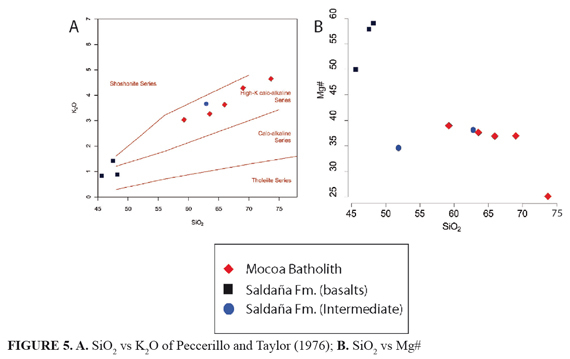 Trace elements patterns of the Mocoa Batholith show remarkable similarities with the analyzed samples from the Saldaña Formation. REE patterns normalized to chondrite (after Nakamura, 1974) are characterized by relative enrichment of LREE compared to HREE (FIGURE 7A), with (La/Yb)N varying between 7.82 and 12.49. A well-defined negative Europium anomaly is marked by Eu/Eu* values between 0.71 and 0.84. Multielement patterns normalized to the primitive mantle after Sun and McDonough (1989) (FIGURE 7B) show a relative enrichment of large ion lithophile elements (LILE) such a as Ba, Rb, Sr and Th and well defined after Pearce et al. (1984) negative Nb, P, and Ti anomalies. On the tectonic discrimination diagrams (Harris et al., 1986; Pearce et al., 1984) all the samples show a magmatic arc affinity (FIGURE 8B and 8C). Two samples from the Saldaña Formation and Mocoa Batholith were selected for U-Pb geochronological analysis. 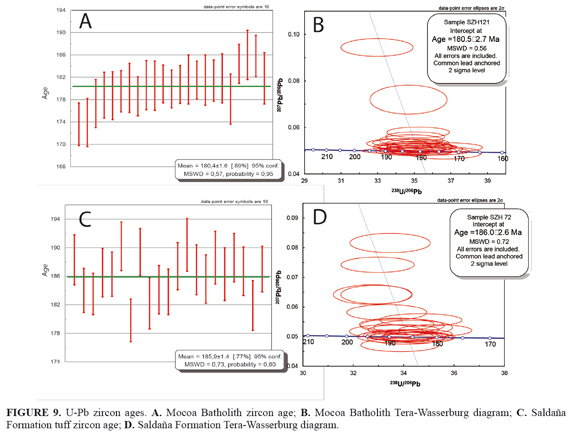 Calculated ages and the Tera-Wasserburg diagrams are presented in Figure 9, geochronological data is reported in Table 2. 34 Zircons from granite of the Mocoa Batholith yielded an age of 180.4 +/- 1.6 Ma (FIGURE 9A) considered as the crystallization age of the plutonic body. Older zircons with ages of 270 Ma 1000 Ma and 1500 Ma may be either related to the source area or partially assimilated crystals. 21 zircons from a porphyritic andesite of the Saldaña Formation have yield an age of 185.9 +/- 1.4 Ma (FIGURE 9C) that we interpret as a magmatic crystallization age. Field relations, geochronological and geochemical data show that the Saldaña Formation and Mocoa Batolith in southern Colombia are spatially, temporally and genetically related to a common Middle Jurassic magmatism between 186-180 Ma. 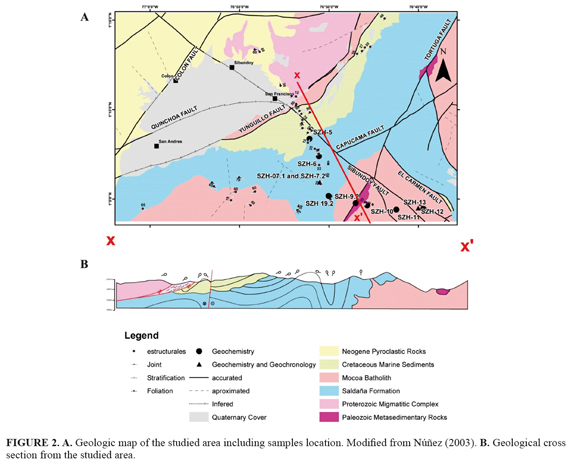 The compositional diversity of the Saldaña Formation varying from basalt to rhyolite and the well-defined correlation in major element bivariate trends are consistent with a typical pattern of differentiation processes of cogenetic igneous systems. The younger crystallization age of the Mocoa Batholith and its intrusive relation in the Saldaña Formation is also a common pattern of related volcano-plutonic systems where the intrusive record the later phases of the magmatic evolution (Lipman, 2007). Trace element concentrations show relative enrichment of LILE and LREE compared with HREE, negative anomalies of Nb and Ti as well as Ta/Hf ratios, is characteristic of a continental magmatic arc tectonic setting (Harris et al., 1986; Pearce et al., 1984; Schandl and Gorton, 2002; Wood, 1980). High Pb is associated to the involvement of the continental crust during magma genesis, either as assimilated or as source component (Miller and Christensen, 1994). Similar U-Pb magmatic crystallization ages and arc related magmatic affinity have been reported in plutonic rocks in the adjacent Garzón Massif and Upper Magdalena Valley (Bustamante et al., 2010) or in the eastern flank of the Central Cordillera (Altenberger and Concha, 2005). Together with other Jurassic exposures in the Ecuadorian Andes (Chiaradia et al., 2009), this suggests the existence of a regional scale contemporaneous arc magmatic history. Although some of the Jurassic remnants in the Colombian Andes may have been displaced from southern latitudes (Bayona et al., 2006), the existence of a major Jurassic continental scale magmatic province and its apparent link with extensional basins (Mpodozis and Ramos, 2008; Sarmiento et al., 2006; Vásquez et al., 2011) reflect the plate convergence following Pangea break-up, and the subduction of an old Pacific plate that controlled the growth of a continental magmatic arc and the contemporaneous regional scale magmatic activity (Busby, 2012; Cawood and Buchan, 2007; Cawood et al., 2009). We acknowledge the Smithsonian Tropical Research Institute (STRI) for its support during several phases of the project. G. Bayona, M. Weber M. and C. Echeverri are acknowledged for their discussions and continuous support and the reviewers who helped to improve the article. S. Zapata acknowledges COLCIENCIAS for a young researchers fellowship. E. Maya and Sibundoy authorities are acknowledged for their support during field work. G. Cañizález is acknowledged for its help with sample preparation.